Remove four (red) screws securing the palm rest. 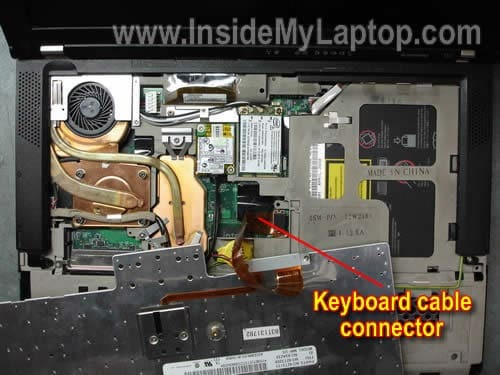 Remove one screw (yellow) securing the keyboard. Lift up the palm rest. 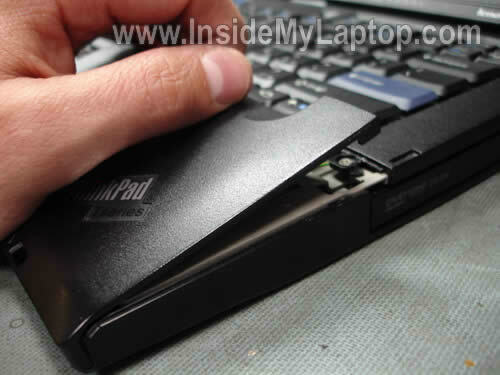 Place the palm rest upside down so you can access the touch pad cable underneath. 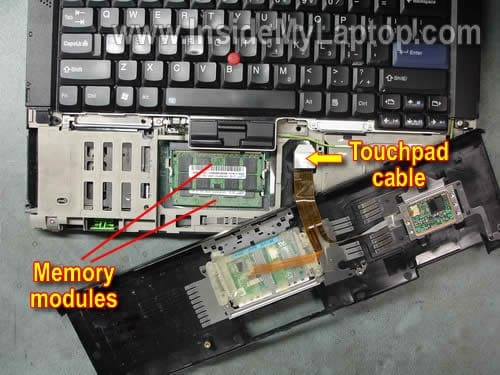 By the way, both memory modules are located under the palm rest. If you are replacing or upgrading memory modules, you don’t have to follow the guide any further. 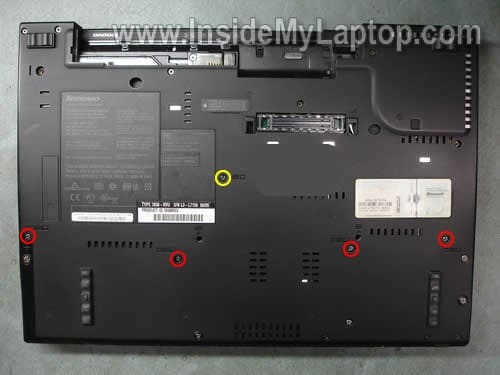 A Lenovo ThinkPad T61 laptop can take up to 4GB RAM total. You can install up to 2GB memory module into each slot. You should use DDR2 PC2-5300 or PC2-6400 memory modules. Lift up the keyboard and place it upside down. 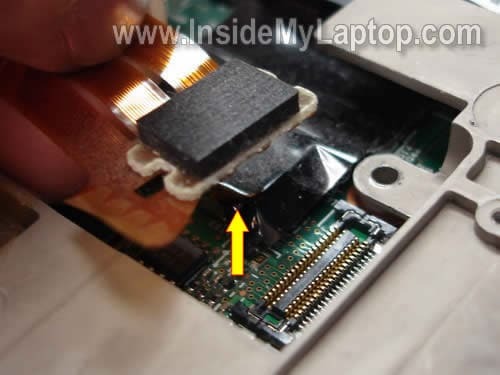 In order to disconnect the cable simply lift up the the connector, same way you disconnected the touch pad cable. 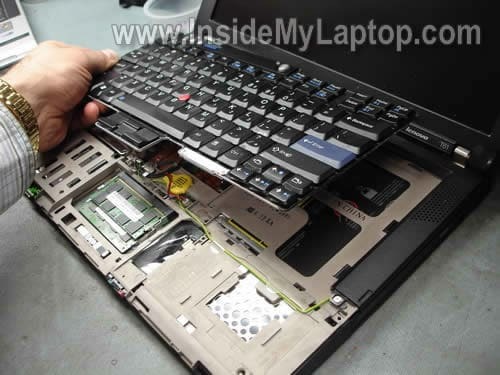 If you are replacing the keyboard, you don’t have to follow this guide any further. 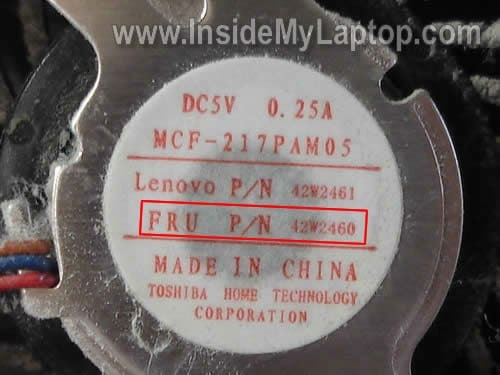 You can find a new replacement keyboard by the Lenovo FRU part number printed on the label. In my case the keyboard part number is 42T3209. 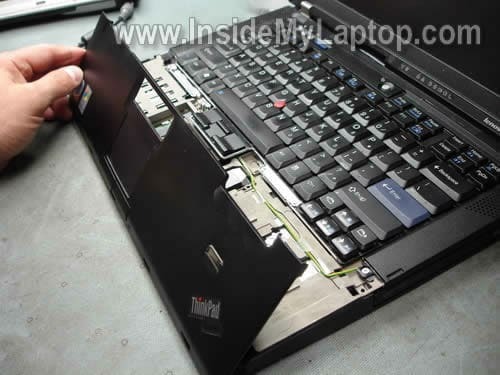 Need a new keyboard for your Lenovo ThinkPad? Search here. Remove three screws securing the speaker cover. 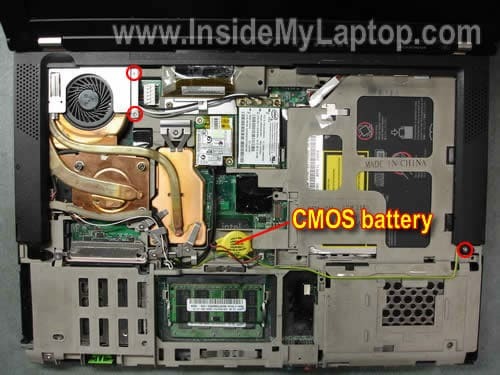 By the way, the CMOS battery is located under the keyboard. 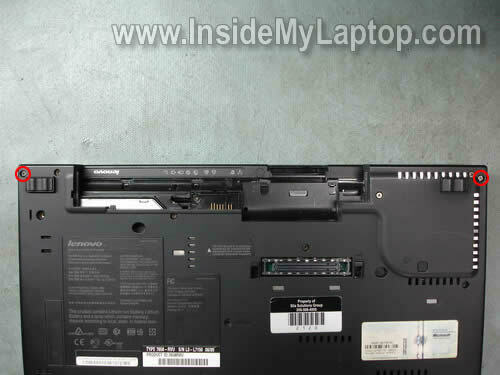 Remove two screws securing the speaker cover on the bottom of the laptop. 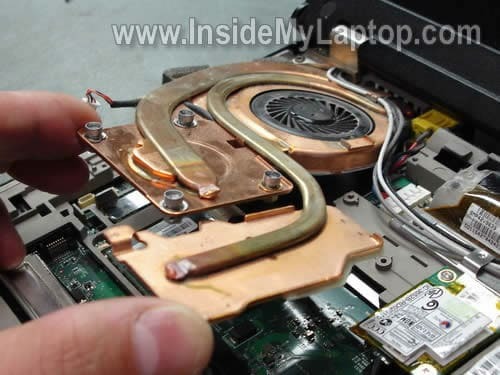 Remove four screws securing the cooling fan assembly brackets. Remove both brackets. I would recommend taking a close up picture of the lower bracket, so you know how the wires are routed. 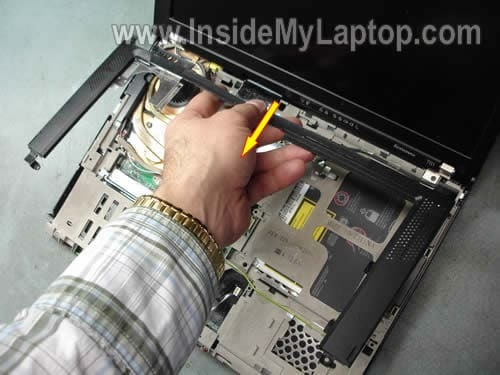 The picture will help you to rout wires correctly when you assemble the laptop back together. Disconnect connectors shown by two arrows. 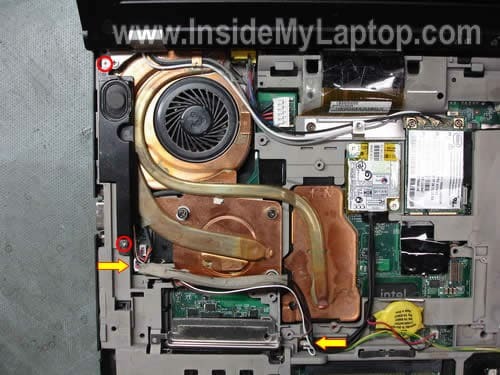 Move the left speaker with cables to the right side, so you can get to the cooling fan assembly. 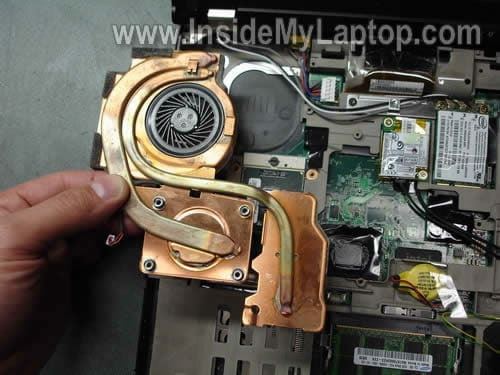 Remove four screws securing the cooling fan assembly. 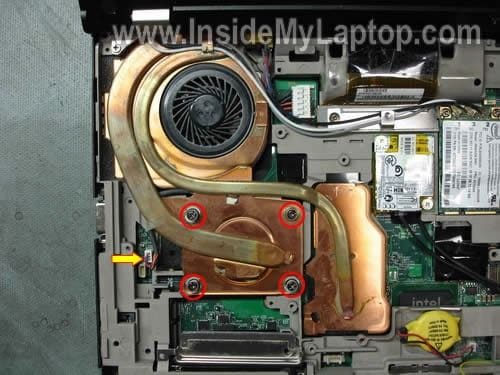 Lift up the cooling fan assembly as it shown on the picture below. On the other hand, if you are installing a refubished cooling fan assembly, you’ll have to apply thermal grease on both chips shown below. 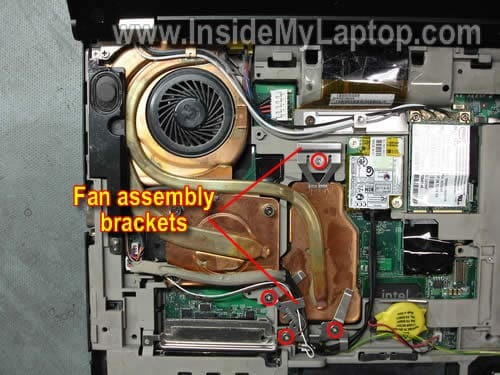 You can search for a replacement cooling fan assembly by the Lenovo FRU number from the failed fan. The FRU number is printed on the label. 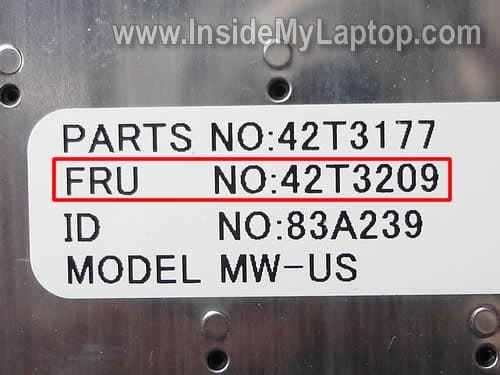 In my case, the FRU part number is 42W2460. 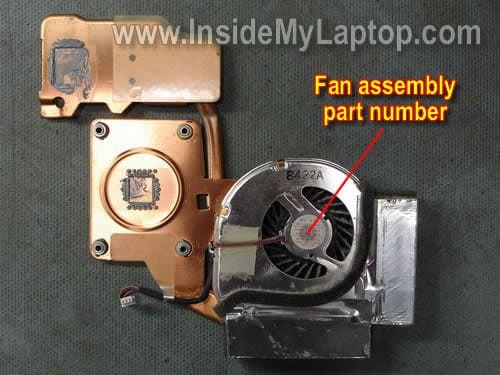 You can find a new or used cooling fan assembly here.